We were provided with press night tickets in order to write this review. Post includes affiliate links. 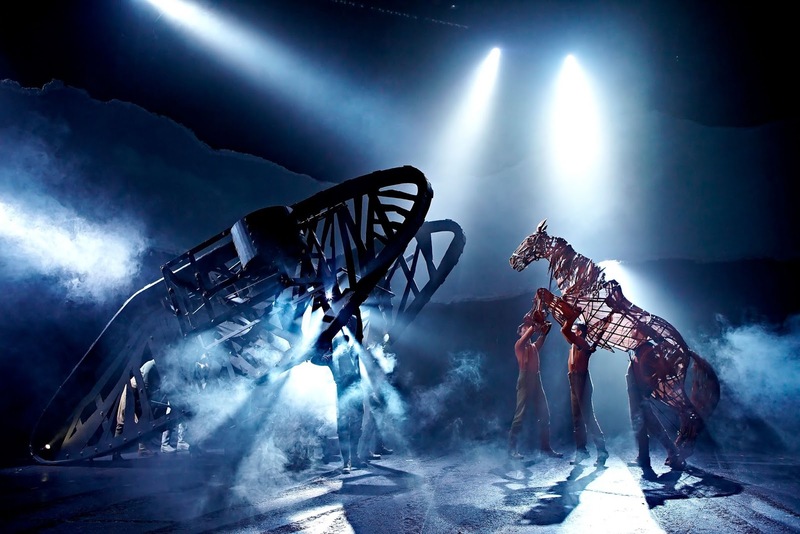 War Horse is a production I've heard a lot about over the last few years. After playing in London's West End for 8 record-breaking years and around the world to over 7 million people to rave reviews, I am delighted that this piece of theatre is heading to Sunderland Empire as part of it's UK tour. It takes something special for us to travel all the way to Sunderland from Northumberland but War Horse was more than worth the journey. Playing at Sunderland from 6 February 2019 - 23 February 2019, tickets are priced from £10 - £66.40 and available online here. For best availability, book mid-week performances. 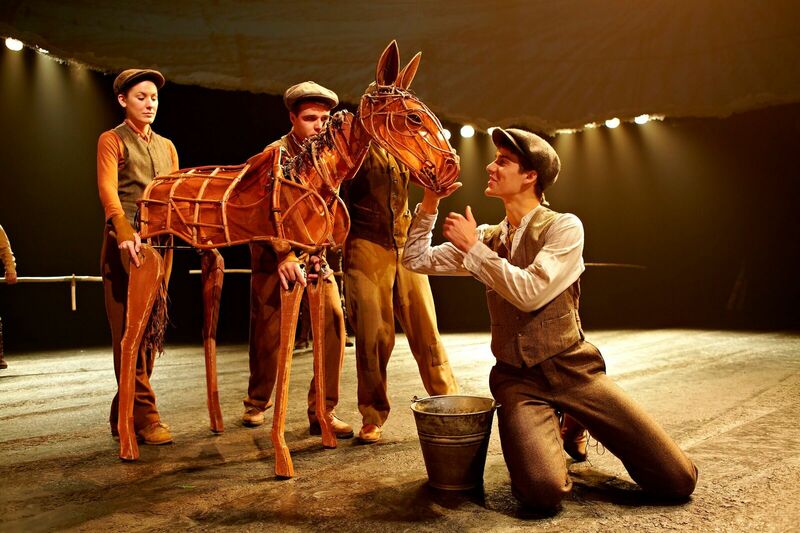 I'm not overly familiar with Michael Morpurgo but loved watching Private Peaceful at Tyne Theatre last year so had very high hopes for War Horse which tells the story of Joey, a horse from Devon who is shipped to France and used in the cavalry during WW1. 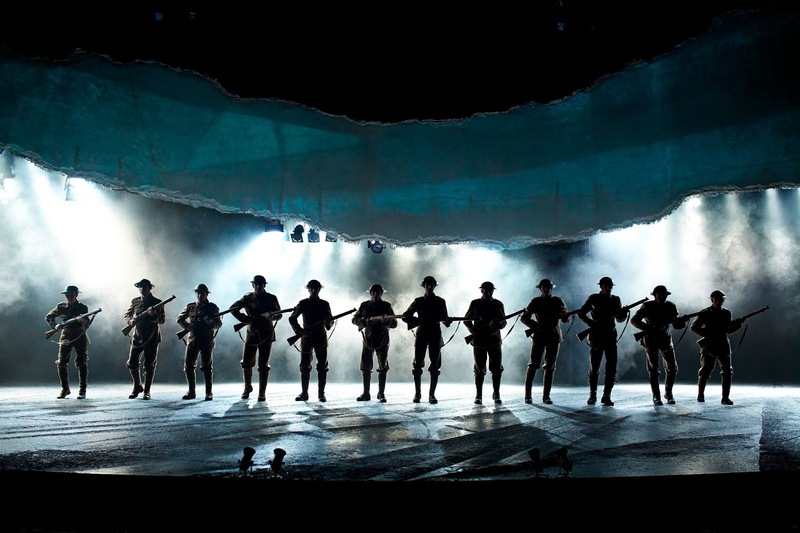 The brutal realities of war are brought to life on stage as life-size (or larger than life?) horse puppets take to the stage and the story unfolds. Sunderland isn't the easiest of places to get to from Northumberland, especially when you're travelling past the Silverlink in rush hour and dealing with A19 road closures. I think it took us around 45 minutes each way. The end of the Silverlink roadworks is in sight though and fingers crossed that it's all done and dusted by March this year. Once the roadworks have been completed, I imagine the drive will be a lot more respectable 25 minutes. We parked in St Mary's Car Park which was easy to find and a short walk from the Empire Theatre. It was one of those rare nights where Steve and I were out without the kids so we decided to head out for dinner at Mexico 70 which is just across the road from the theatre. You can't book here unless you're a big group (booo) but we managed to find a table. We absolutely loved it here and feasted on a variety of fresh tacos, spicy chicken wings with proper nachos and homemade dips. So good! Our bill for 6 dishes plus 2 beers was only £33 which was excellent. Steve will write a full review on BigStevieCool.co.uk soon but if you're looking for a place to eat before the theatre, Mexico 70 is worth a look. 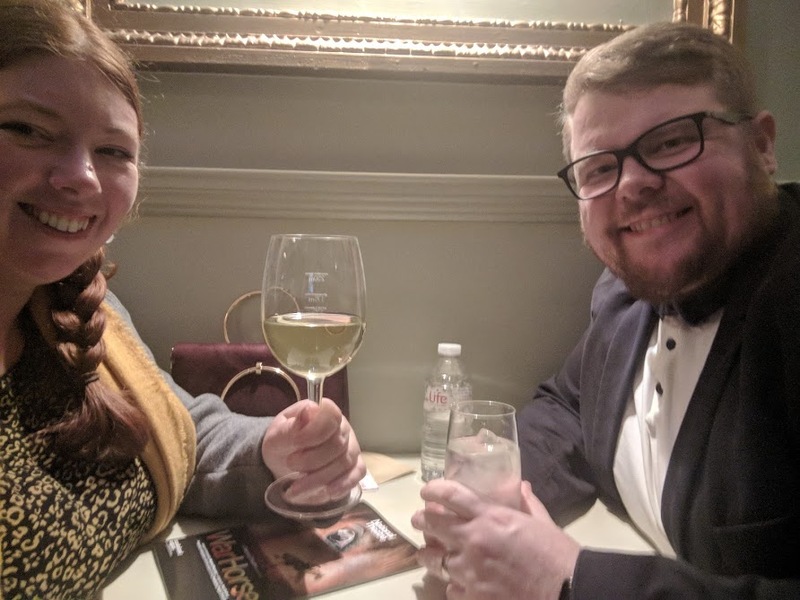 After dinner, we had 30 minutes left before the show started so popped to the Empire Bar for more drinks before the show. Definitely one of the nicer theatre bars I've been in and it was really well staffed too so service was speedy. As a side note, Sunderland Empire has a cool app where you can order drinks and snacks to be delivered to your seat in the interval. How fab is that! If you're watching a show here anytime soon, look out for the info leaflets by your seats. We were seated in the dress circle and had a fabulous view of the stage and the seats were nice and comfy too. The thing that first caught my attention was how big the stage was. I was chatting to a lovely lady in the interval who informed me that Sunderland Empire is the biggest theatre stage North of Manchester (I haven't found anything online to verify this but have no reason to believe it's not true) and that most West End shows choose this theatre over theatres in Newcastle as they don't have to compromise on their production or scale it down in any way. This makes complete sense and with 1860 seats and 4 tiers, it certainly feels grand. War Horse is the perfect production to put this large stage to good use and the simple yet effective staging was a complete joy to watch. A whole village of people appeared from nowhere, there was sufficient space to demonstrate the puppeteers' incredible skill as the horses galloped around the stage and simple props turned an English village into a boat crossing the Channel to the trenches of WWI and the banks of the Somme in a blink of an eye. There was one particular scene as the soldiers slowly walked from the mist towards the audience and into the firing line that will probably stick with me forever I think. It was harrowing. The horses really are the star of the show here and they're absolutely incredible to watch. You don't even notice the actors on stage and really do see them as real life horses. The detail in their movement is spot on and I honestly can't imagine how long technical rehearsals most have taken to get their movements to be so precise. They're an absolute joy to watch. War Horse heavily focuses on the reality of war and it is a difficult yet equally an important watch. Until now I'd never really thought about how animals were used in WWI and it's incredibly sad to think of all that bloodshed for no reason whatsoever. The special FX are fantastic, expect bombs, guns firing and explosions. They are loud and big and you will probably jump on more than one occasion. It's not all doom and gloom and the theme of friendship strongly runs through the show. Albert and Joey's friendship is something anyone who has owned a pet will resonate with and their bond is beautifully portrayed on stage. Family dynamics are also explored with the running theme being that whatever happens, family will always be there for you and you can expect lighthearted moments and laughs as Albert makes new friends in the trenches too. Look out for the Geordie soldier who was a favourite with the audience. I am not a strict parent when it comes to age recommendations. War Horse is recommended for children aged 10+ and before seeing the show, I would have happily taken my three (aged 8,9 and 12) along. They're not particularly sensitive children. However, this is one occasion where I think you should pay attention to the age recommendation as War Horse is difficult to watch in places and fairly traumatic. One lady had to leave the auditorium at one point as she was so distressed and in hysterics crying. The horses are so realistic and you will see them being whipped and abused on stage and there are some difficult scenes where they are blown up in front of your eyes and shot at point-blank range. The hardest part for me was when two of the horses became so exhausted and could no longer go on so simply died from exhaustion. It was beautifully portrayed but because it was so realistic, definitely a hard watch - especially for animal lovers. Heidi and Jack would not have coped well watching War Horse but Harry (12) would have been absolutely fine. If you're visiting as a grown-up, take tissues. 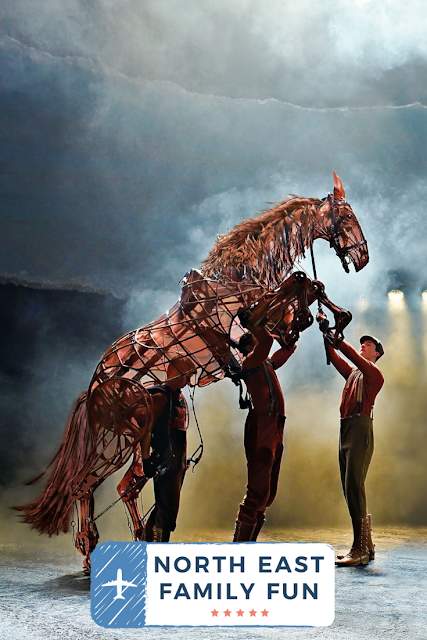 Despite War Horse being harrowing and distressing in places, it was absolutely fantastic and you will leave the theatre feeling wowed and strangely uplifted. I'm so thankful that I got to experience War Horse and would highly recommend to others. Watching the production really was like watching a West End show in London and we're lucky to have such a high-quality production here in the North East. 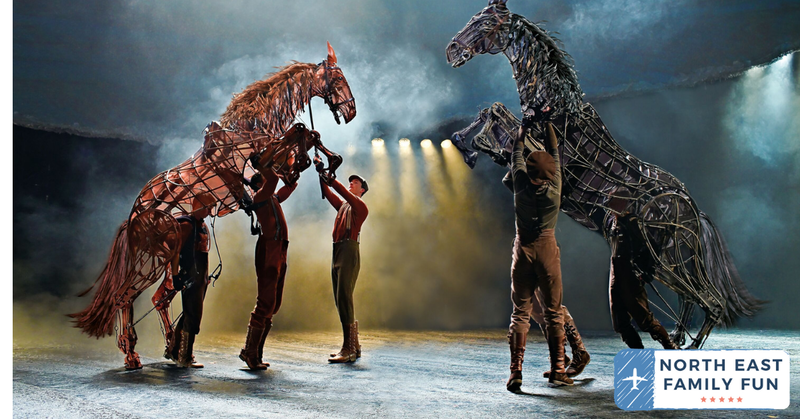 War Horse might make you cry, it will make you jump, you'll laugh in places and you'll leave with more of an understanding about the realities of war and the special bond us humans have with animals. You'll also leave feeling incredibly impressed by the skill showcased by the horse puppeteers and the theatrics of it all. How do they do it?? The show ended with a much-deserved standing ovation and rapturous applause. Sunderland Empire was absolutely buzzing and everyone was on a real high as they left the building - I love that feeling that connecting with a fantastic live performance gives you. I wish you could bottle it up. Sounds like a great mid-week night out-both the show and the meal! It's a lush theatre & you are right it's a nice bar too! ha ha!